I’ve made a lot of escabeche in my time, and have read scores of recipes from all over the world. Escabeche, if you don’t know about it, is a vinegary, bracing sauce that makes for a nice easy lunch for several days after you make it because escabeche keeps for more than a week in the fridge. Scholars say Arabs invented the technique of cooking a meat or fish and sousing it with a vinegary sauce, probably sometime in the early medieval period. Then again, the ancient Romans were particularly fond of vinegar sauces, so I personally would put my money on either them, or the Greeks who preceded them, as the inventors. In its modern form, escabeche is a Spanish creation, and this is the country I turn to for my own escabeche. The Spanish in turn spread the dish all over their empire in the 1500s, and what has emerged over the centuries are subspecies of the Spanish escabeche in Mexico, South America and the Philippines — and then there are the Portuguese, who can also lay legitimate claim to the dish, although every Portuguese escabeche I’ve seen has been pretty plain-Jane. Why bother doing this? Because meat prepared this way will keep for days, even weeks if the weather is cool. And as it is most typically made with game birds or fish — both things that you can have a too much of after an unexpectedly good day — so semi-curing the meats makes a lot of sense. There is another element to escabeche that needs mentioning: It is a surpassing dish for lean game birds, as the olive oil and vinegar-wine sauce keeps everything from drying out. Red-legged partridges, or perdiz, are the classic Spanish escabeche bird; the closest thing we have to them here are chukars. 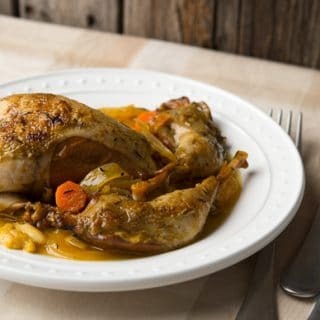 That said, I have read Spanish recipes for cordoniz (quail) and faisan (pheasant), as well as American versions with the very dull Cornish game hen. 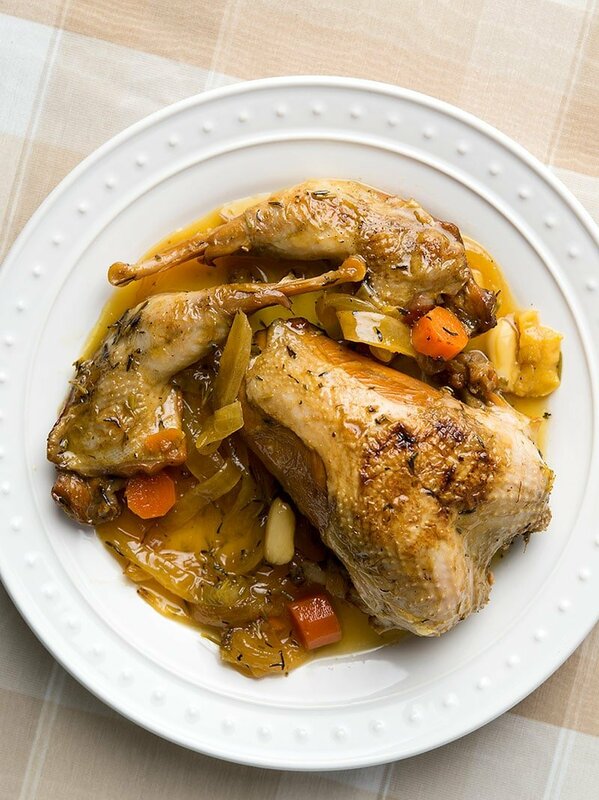 If you are not a hunter and want to make this dish, please — for me — buy either a really good chicken and cut it up, or farm-raised quail or pheasants. It’s worth it. Yes, fish escabeche is also very common, and in fact I make an Italian version of this called scapece. It is simpler than the Spanish escabeche, and is designed to be used with oily fish such as mackerel, herring, bluefish, or, as I did, sardines. Here is the recipe. The key difference between the more common seviche (also spelled ceviche) and escabeche is that you cook — often fry — the meat before it hits the vinegar sauce. That helps with the preservation and also makes sure your game birds are falling-off-the-bone tender. Other common ingredients include paprika, carrots, celery, parsley, rosemary, cloves and oregano. A few include olives and, as I do, saffron. Again, regionality. Mexican escabeche uses fruit vinegars or lime juice. Portuguese versions use cider vinegar, Italians wine vinegar. Chiles or no? Mexicans and Italians say yes, but I rarely see hot chiles in either Spanish or Portuguese versions. I leave them out, as they compete with the saffron. How hard is escabeche to make? Kinda in the middle. It’s not simple, but nor is it any great feat to pull off. Mostly it takes time to get the proper browning on the bird and in simmering to get it tender. Oh, and I know what many of you are thinking: Why not pull the meat off the bones to make it easier to eat? Yeah, I know I could. But I like getting into my food, and this sharp, rich sauce makes eating the pheasant a more primal joy. Besides, I like wiping the grease off my chin. Escabeche (es-kah-BECH-ay) is an ancient preparation historically used with fish or game birds, notably the Spanish red-legged partridge, which is a cousin of our chukars here. Basically you sear the birds and then souse them with a flavorful, vinegar-based sauce for a day or three. You can eat escabeche cold, warm or at room temperature, and I typically serve it as a room temperature, for a light dinner or lunch. If you don't have partridges, use pheasants, quail or grouse. 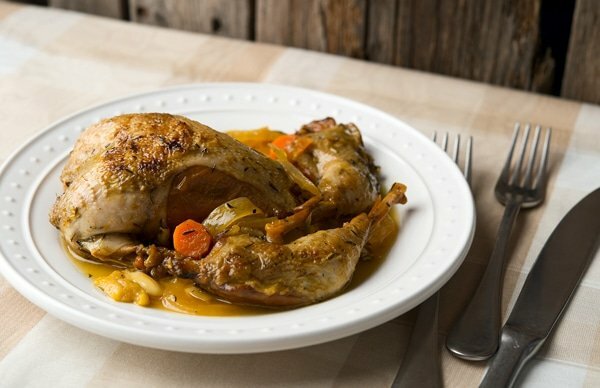 Non-hunters out there, you can either buy quail or pheasants at the market (look in the freezer section) or use Cornish game hens, which are just a baby chickens. Not as flavorful, but easier to find. Could you use a full-sized chicken cut up? You bet. Cut your birds into serving pieces (leave quail whole) and salt them well. Set aside. Heat the olive oil in a large Dutch oven or pot with a lid over medium heat and cook the lemon peel in the oil until it browns. Remove and either discard or eat (it's tasty!). This adds another layer of flavor to the escabeche. Cook the birds. You have two choices here. Either brown them in the olive oil you just flavored with lemon, or paint them with that olive oil and grill them over an open fire. I do the former in winter, the latter in summer. Saute the onion and carrots in the lemon-flavored olive oil until just beginning to brown. Add the garlic and saute for a another minute, stirring often. Pour in the vinegar, white wine, all the herbs and spices and bring to a simmer. Return the birds to the pot and add a little water if you need more liquid: You want the birds to be almost submerged, but not completely so. Cover and simmer slowly for 90 minutes. Let the birds cool in the sauce for an hour or so. Serve cold, warmed up or at room temperature with white wine or beer, and either boiled potatoes or lots of crusty bread. I always make this a day before I eat it, but you could make it in the morning and serve that night. It will keep in the fridge for a week or so. Note that cook time includes steeping time. Definitely a wonderful dish! Reminds me that I haven’t had a decent escabeche in quite a while!